I am not fond of the word “famous” when used in relation to human beings. There are all sorts of folks who feel they are important, powerful, persuasive, good looking or brilliant. In many instances their self-assessment does not match how others perceive them. Often celebrities are simply famous for being famous and seldom produce many positive ideas or results from their labors. With this in mind I want to write about some Genevans who are well recognized for their contributions to their city, nation or profession and not just write about the powerful or the beautiful. First, we have the people that come readily to mind. Often they did not live in Geneva their entire lives but during their time here they participated in events that cause people to remember their names. For instance, Bishop John Hobart (1775-1830), an episcopal priest who was in charge of the 46,000 square miles of virtual wilderness in New York State west and north of Albany and was passionate about his calling. It is said of him that he had the energy of 10 men and never allowed politics to override his principals. Once convinced of the righteousness of a cause he could not be swayed from it. On a statewide visitation in the late summer of 1818 Bishop Hobart decided the Episcopal theological college in Fairfield was in the wrong village and not successful. Hobart continued with his state tour and by the time he reached Geneva he had made up his mind to build a college in the Village of Geneva; in doing so he began Hobart College. Next is William Smith (1818-1912), co-owner of the prosperous nursery firm, W. & T, Smith. In 1906 he became inspired to establish a non-denominational college for women, who would use Hobart College staff and equipment. By 1908 William Smith College opened with 19 students. In addition to the college, William Smith’s nursery provided many jobs for the inhabitants of Geneva. Mr. Smith also donated the land and money to build the Smith Opera House on Seneca Street and was a benefactor to many good causes in Geneva. He is immortalized in a sculpture on the Hobart and William Smith quad. Of course one name that is easily recognized is that of Elizabeth Blackwell (1821-1910), born in the England and a woman pioneer in the medical field. 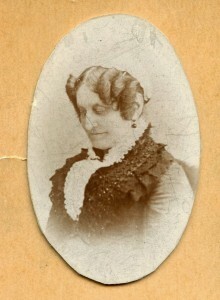 Dr. Blackwell was admitted amongst much controversy to the Geneva Medical College and while the majority of the male students treated her fairly many of the townspeople were scandalized and acted accordingly. Elizabeth eventually achieved her degree and became known as the first woman to gain her medical degree in the United States. 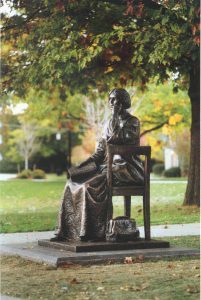 She is also commemorated in sculpture on the campus quad. Lauren Holley, Arthur Dove and Scott LaFaro are/were all artists who have Geneva connections. Actress Lauren Holley (1963- ) graduated from Geneva schools and has performed in many different productions including Picket Fences, Hill Street Blues, All My Children, Dragon: the Bruce Lee Story, and Any Given Sunday to name just a few. Arthur Dove (1880-1946), often considered the first “American Abstract Painter”, was born to a wealthy Canandaigua family and moved with them to Geneva when he was 3 years old. Mentored by a neighbor, Newton Weatherly, Dove became interested in art and attended Hobart and William Smith and graduated from Cornell University. He did some of his most well regarded paintings in the 1930s while temporarily living in Geneva. 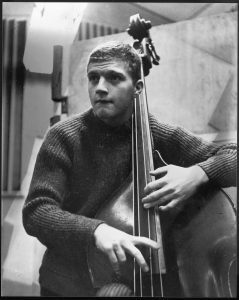 Rocco Scott LaFaro (1936-1961), was a highly regarded double bass player known for his work with the Bill Evans’ Trio. At various times he studied piano, bass clarinet and tenor sax before settling on the double bass. Although his performing career lasted only six years, LaFaro’s innovative approach to the bass redefined jazz playing. Second, we have some people who were very influential because of their accomplishments, but are not as readily recognized. Some of them are people like Charles Folger (1830- 1884) who was a member of the Geneva Bar Association and won national recognition as a lawyer, judge, and statesman. Folger represented Ontario County in the State Senate and was a delegate at large to the Constitutional Convention. In 1881 he was appointed as Secretary of the Treasury. Two other people of note are Elizabeth Smith Miller and her daughter, Anne Fitzhugh Miller, who were ardent supporters of woman suffrage. Elizabeth, also a believer in “dress reform”, was the designer of the “bloomer costume” and wore it to visit her cousin Elizabeth Cady Stanton in Seneca Falls. Here Amelia Bloomer, editor of the newspaper The Lily, saw the costume and became a firm believer in its style and convenience. Amelia made the outfit popular though The Lily, hence the name “bloomers” and Elizabeth never got the credit for the design that she deserved. Some other well regarded Genevans are Sarah Hopkins Bradford (1818-1912), author of two biographies on Harriet Tubman, was a well-regarded resident of South Main Street. Mrs. Bradford wrote, Harriet Tubman, the Moses of her People and Scenes in the Life of Harriet Tubman. She also wrote a history of the City of Geneva, which was published in an Ontario County Directory in the 1860s. 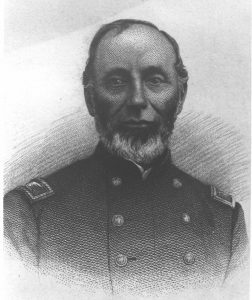 Then there is Eliakim Sherrill (1813-1863), who was a United States Congressman, and a Brigade Commander for the Union Army in the Civil War. He died leading his troops during the Battle of Gettysburg and when he was buried in Washington Street Cemetery 10,000 people were supposed to have attended. Another notable man in Geneva’s history is the Rev. Jedediah Chapman (1740-1813) who started many of the Presbyterian churches in the Geneva Area as a missionary. He was installed as the senior pastor of the Presbyterian Church in Geneva in 1812 and was one of the incorporators of the Geneva Academy, forerunner to Geneva College which later became Hobart. Dr. William Brooks (1844-1921) was a very important astronomer who came to Geneva to work in the William Smith Observatory. Between 1881 and 1921 he discovered 27 comets! Born in England in 1844, by the age of 14 William had constructed his first telescope. By age 17 he had given his first astronomical lecture in his father’s church. He continued his interest and study in science and photography and was a pioneer in celestial photography. He is buried in Glenwood Cemetery and his headstone has a comet on it. Very recently another man with Geneva connections made the news. Steven Penn, a professor at Hobart and William Smith Colleges was part of a team that won the 2017 Nobel Peace Prize for their work on gravitational waves! Geneva is filled with people who work diligently, often with little or no recognition, to accomplish many things that benefit our city, our nation and even the world. Perhaps you would call them famous or perhaps you would call them notable, but you would certainly count them among the important people in the City of Geneva, New York. Great article. Please write about Patrick Mulcahy. He laid Geneva’s sidewalks in the middle 1800’s. Very good article. Just one minor correction, Arthur Dove’s family was not a “Wealthy Canandaigua Family” The Dove family roots are in Geneva. Arthur’s father was elected Ontario County Clerk and moved the family to Canandaigua during his term of office. During that time Arthur was born. Don’t forget actress Lauren Holly, author Dan Brown (Davinci Code), and Mark D. Leitner.